The University of Kentucky’s history is marked by resilience and shaped by an unyielding and compassionate commitment to those we serve. Today, informed by that past, we are focused on the future. We are the pulse of our state’s economy and the hands that heal its communities. We are the voice of Kentucky’s arts and letters and the power behind discoveries that uplift and advance. 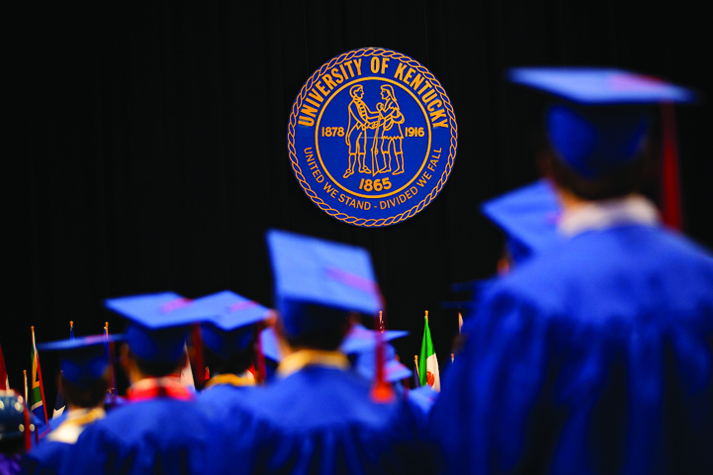 The University of Kentucky is fulfilling an ambitious vision established by the President and its Board of Trustees. This place has been – and continues to be – home to pioneers and providers, bold dreamers and strategic thinkers, who make our vision and work possible. Thanks to the efforts of those who came before us, we are poised to do more and be more for those we serve. Together, guided by the leadership of the Board of Trustees, we will show the world what Kentucky can do. Kentucky can bring hope to those in need and in pain. Kentucky can equip the new leaders who will show us the way. Kentucky can find answers to the biggest questions we face. Kentucky can work harder, reach higher, and dream bigger for the future of our institution, our students, and our state. UK has launched a $2.1 billion campaign to tackle these challenges by improving opportunities for student success, funding innovative research, improving healthcare for all Kentuckians, strengthening our alumni network, and supporting our athletics programs. It is a historic effort, but one that we can accomplish with your help. Together, we will show the world what Kentucky can do. Established in 1957, the medical center at UK is one of the nation’s finest academic medical centers and includes the University’s clinical enterprise, UK HealthCare. The 724 bed UK Albert B. Chandler Hospital and Kentucky Children’s Hospital, along with 221 beds at UK Good Samaritan Hospital, are supported by a growing faculty and staff providing the most advanced subspecialty care for the most critically injured and ill patients throughout the Commonwealth and beyond. The number of patients served by the clinical enterprise has increased from roughly 19,000 discharges in 2003 to more than 38,000 discharges in 2017. UK Chandler Hospital includes the only Level 1 Trauma Center for both adult and pediatric patients in Central and Eastern Kentucky. UK has a strong faculty core that supports more than 200 academic programs spread across 16 degree-granting colleges, the Lewis Honors College, the Graduate School, and the UK Library. In the last several years, UK has received nearly 100 national rankings for excellence in academics, research, health care, and economic development. U.S. News and World Report ranks the UK Martin School of Public Policy and Administration fourth in the nation in the category of public finance and budgeting and the College of Pharmacy as sixth. The University of Kentucky earned 28 Top 10 rankings and 50 Top 25 rankings over the last several years. The University of Kentucky Athletics Department is a 22-sport program dedicated to competing at the highest level nationally and in the Southeastern Conference, while enriching the lives of its nearly 500 student-athletes – both during and after their time at UK – and honoring the deep connections it shares with its fans, the Commonwealth of Kentucky and the university it represents. With a rich tradition that dates back to 1881, UK Athletics seeks to live out its core values of character, integrity, knowledge, stewardship, and competiveness every day. Those core values serve as the foundation for the pursuit of the current goals set forth in Elite 1-3-5: for every UK team to win a conference or national championship by 2022, to continue an ongoing streak of 12 straight semesters with a cumulative grade-point average of 3.0, and to finish in the top five of the national all-sports standings by 2022.